Poor WASH behaviors lead to more than bouts of diarrhea; they compromise human potential. Evidence linking open defecation to stunted growth as well as the effects of tropical enteropathy, a subclinical condition caused by the repeated ingestion of human and animal feces, on children’s nutritional status are beginning to emerge. In the face of this growing evidence base, practitioners are looking for new ways to integrate WASH into nutrition programming. In northern Mali WASHplus is implementing a two-year WASH and nutrition project in 18 communes in three districts of the Mopti Region. The project aims to improve the nutritional status of women of reproductive age and their children (especially those under 2 years of age) through the adoption of complementary WASH and nutrition behaviors (fixed point defecation; hand washing with soap; safe water treatment, handling, and storage; exclusive breastfeeding; and improved infant feeding practices). To do so, WASHplus targets barriers on both the supply and demand side that hinder access to improved sanitation and healthy nutrition practices. WASHplus also provides training to community health workers (known as relais) already in place in the target neighborhoods on screening and referral of malnourished children, infant and young child feeding practices, and how to negotiate small doable actions related to healthy WASH/nutrition practices. Relais organize cooking demonstrations in communities triggered using CLTS. Complementary feeding practices promote to mothers emphasize the importance of hand washing with soap and the use of treated water to wash and prepare complementary foods. As in other countries, WASHplus triggers change in sanitation practices through the community-led total sanitation (CLTS) approach with a “plus” component that includes construction and correct use of a hand washing facility outside the latrine. In Mali the plus component also signifies supply-side interventions to develop low-cost latrine models appropriate to the unique environmental conditions in each district coupled with training community-based masons to build robust latrines using local materials. To complement the CLTS-driven approach in rural areas, WASHplus is beginning a sanitation marketing activity to engage materials suppliers and local entrepreneurs to market a line of aspirational sanitation products in Mopti’s urban areas. Declaring an End to Open Defecation One Village at a Time, 2014. The WASHplus integrated WASH/nutrition initiative in Mali targets 187,000 women of reproductive age and approximately 60,000 of their children, aged 0–59 months in three districts with high rates of stunting in the Mopti Region. One of the project’s objectives is to increase demand for low-cost sanitation among rural households and communities. WASHplus employs the community-led total sanitation (CLTS) approach to ignite villages to collectively abandon open defecation and empowers household investment in environmentally appropriate low cost latrine models. Read the French version. Relais Champion New Behaviors to Transform Lives, 2015. In Mali, WASHplus-trained relais (community health workers) identify opportunities for behavior change promotion in the areas of hygiene and sanitation and conduct nutrition screening, referrals, and demonstrations that also incorporate WASH messages. Read the French version. Musings from Mopti. Rural Water Supply Network Blog, Feb 2014, by Jonathan Annis, WASHplus - I’ve spent the last week in the Mopti Region of northern Mali supporting a USAID/WASHplus WASH & Nutrition initiative led by CARE. While behavior change communication related to household- and community-level sanitation, hygiene, and infant nutrition practices is the primary focus of the project, a small sum of funds is dedicated to rehabilitating community water supplies. Read more. Latrines Traditionnelle Delle Demontable, 2014. 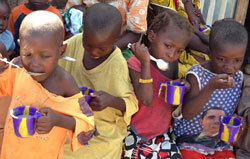 USAID/Mali; WASHplus. View the video. This report presents the findings of a baseline survey conducted in three districts in the Mopti Region in Mali: Mopti, Bandiagara, and Bankass. The survey was used to assess the prevalence of exclusive breastfeeding of children under 6 months and dietary supplementation in children 6 to 24 months. It is available in French and English.